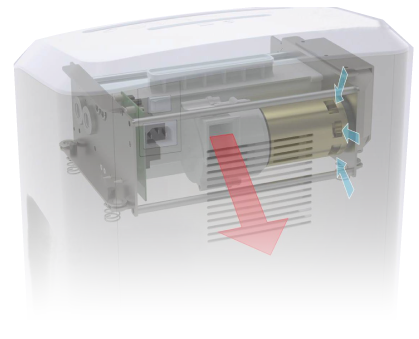 bonsaii machines are fitted with a patented high performance cooling system; this provides the ultimate shredding experience and is unsurpassed in this area of the market. Cool air is circulated and hot air is expelled to ensure the cutting system is always working at the ideal temperature for the highest shredding performance. Most shredders in the market quote a ‘duty cycle’, for example 10 minutes shredding and 20 minutes cooling, unlike the competition these shredders have unsurpassed performance, with the higher models providing up to 4 hours of continuous shredding. bonsaii machines are designed to get the toughest shredding job done in the shortest time with no waiting for the machines to cool down, saving you time and money. bonsaii shredders provide the ultimate performance with safe, stable and continuous shredding for 1/2/4 hours; try this high reliability shredding technology and forget about waiting for your machine to cool down again.